Google started its ambitious self-driving car research project back in 2009. At the beginning of 2018, several companies are developing autonomous vehicles and the auto industry is at a breakthrough point. These top players in the self-driving car technology boom are on the cusp of delivering road-ready vehicles to the public in 2019. Discover the top self-driving car technology companies in 2018 and see what they offer the industry. Waymo is an offshoot of Google and it has the most ambitious timeline for putting autonomous vehicles on American roads. Since its inception, Waymo logged more than 4 million road-miles while testing its self-driving cars. Waymo launched a high-profile partnership with Fiat-Chrysler to get 600 minivans in service as robot taxis in Phoenix by the end of 2017 or early 2018. The key to Waymo’s push for autonomous cars is creating in-house Lidar technology. These systems can cost as much as $75,000, but Waymo’s investment slashed this cost by a whopping 90 percent. For self-driving cars to come into the mainstream, costs must come down before consumers get on board for purchasing these expensive items. Waymo is on track to do just that. Waymo tested its vehicles in late 2017 without a driver on board at all. GM’s entry into the self-driving car race is heating up to compete with Waymo. The Detroit automaker partnered with Lyft in January 2016 to invest $500 million in a fleet of autonomous ride-hailing vehicles. 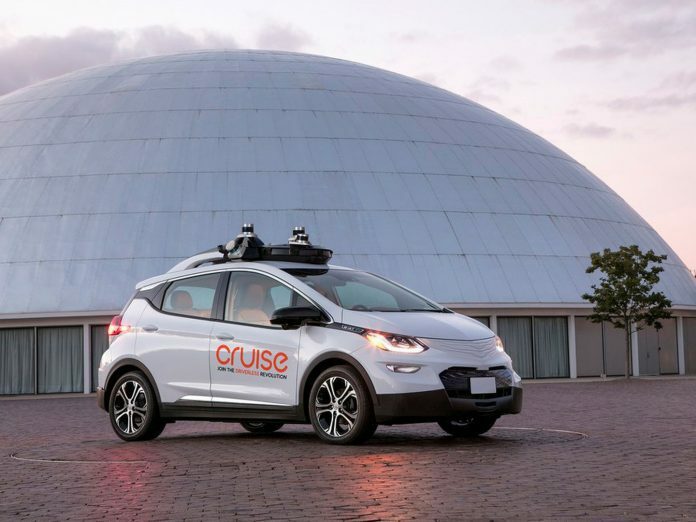 Later that year, GM acquired tech startup Cruise to outfit the fleet of vehicles. GM doesn’t have nearly the amount of miles as Waymo, but it tested more than 100,000 miles of driving in 2017. GM wants a fleet of self-driving cars on city streets sometime in 2018 as proof-of-concept. The first car in the fleet is a Chevy Bolt. Three cities, Detroit, San Francisco, and Scottsdale, Arizona, serve as testing grounds for these autonomous vehicles. A commercially viable ridesharing service is number one on GM’s list in terms of recouping its major investments. Mass-producing self-driving cars is next, something that GM is very good at accomplishing. GM’s autonomous vehicle designs do not have steering wheels or foot pedals whatsoever. Ford started its push for self-driving cars during the 2005 contest sponsored by DARPA. The Detroit-based automaker has a goal of fully autonomous vehicles on American roads by 2021, and it’s testing fleets in Michigan, Arizona and California. Ford partnered with Baidu to invest $150 million in Lidar company Velodyne. More importantly, Ford pumped a whopping $1 billion into Pittsburgh-based tech startup Argo AI over five years to create advanced software to go into its cars. Argo AI was started by veterans of Google and Uber, so these self-driving technology companies already have an advantage due to top-notch engineering talent and excellent programmers. Ford also partnered with Lyft to develop a fleet of cars for ridesharing purposes. Forbes believes Ford is on the cutting edge of self-driving tech simply because of its production clout and huge partnerships. Volvo made big investments in the self-driving car game when it made a $300 million partnership with Uber. Volvo wants to gradually test autonomous features in road-capable cars until the company reaches full self-driving capabilities sometime in 2020. Uber’s program reached 2 million tested miles in December 2017. Volvo lets families test drive some of its autonomous cars in Gothenburg, Sweden and London as part of its vaunted Drive Me program. The automaker plans to expand to a more complicated test in China with a fleet of 100 Volvo XC90s. As of 2018, Volvo and Uber are testing a fleet of ridesharing vehicles in Arizona. Nissan has a partnership with European stalwart Renault to test is ProPilot program in Japan. This technology takes drivers on a self-driving tour of Japan’s highways as a testing ground. Eventually, Nissan-Renault plans to expand the testing to China, Europe and the United States. Like Volvo, Nissan plans to have fully capable self-driving cars available for purchase in 2020. The Japanese automaker has one innovation with regards to customer service. If someone experiences a problem while in one of these cars, that person can call Nissan support to figure out what to do. Microchip company Intel bought MobilEye for an astonishing $15.3 billion in 2017. That’s because Intel wants to lead with way by providing hardware and processors for advanced software that needs to go into self-driving cars. The Intel-MobilEye acquisition paid off when auto parts company Delphi agreed to use Intel chips and processors in its vehicles for testing. If all goes well here, Intel stands to gain a huge return on its investment if these three self-driving car technology companies can prove their products are safe and reliable. Drive.ai is a somewhat late entry into the self-driving car field. Founded in 2015 in Silicon Valley, Drive.ai specializes in deep learning. This is where computer programs gather data and improve upon themselves over time as they have access to more and more information. Drive.ai is looking to break into the Asian market. It partnered with Grab, a rival to Uber in the Southeast Asia market. Drive.ai wants to test its software on the streets of Singapore as soon as possible. Elon Musk’s Tesla plans to merge the all-electric vehicles with self-driving options at some point in the middle of 2018. The Tesla Autopilot system saw a few hiccups with high-profile accidents and glitches, but a second version is due out. Tesla uses sensors rather than Lidar in order to save on costs but also to have its own proprietary system. Tesla wants to prove its concept by having a cross-country journey from California to New York in an automated car during the summer of 2018. Experts are wary of Tesla’s entry into this market because of safety concerns and not using a tried-and-true Lidar system. All of these companies stand to win if they can prove their products work. There are snafus to overcome, plus there must be industry standards implemented to make the transition to autonomous vehicles safe for passengers. Self-driving car technology companies want to make money on their investments, which is why Uber, Lyft and ridesharing companies are investing heavily in this technology. Self-driving cars reduce accidents and obviate the need to pay drivers. Eventually, self-driving cars filter down to average consumers. Prices should be high at first, just like everything else new that comes into an emerging market. Cell phones were a luxury item for the rich at one point, but now everyone uses them. Self-driving cars should follow the same path due to all of this initial investment by huge companies with deep financial pockets.